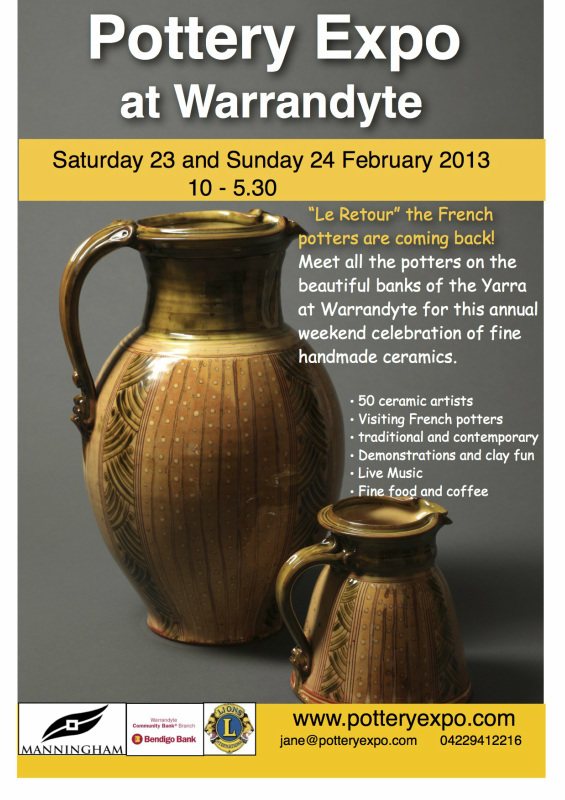 Visit the French stand at the annual Pottery Expo in Warrandyte. Ceramics from France plus information about upcoming French tours with Zeste French Tours. 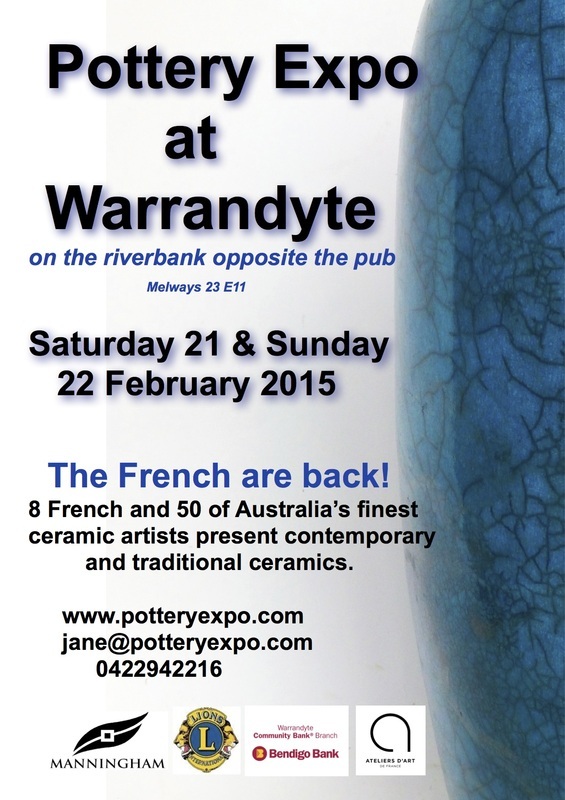 The French Potters are coming back for the next Pottery Expo at Warrandyte. Keep this weekend free. 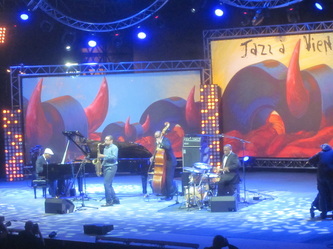 Lots of French events happening. 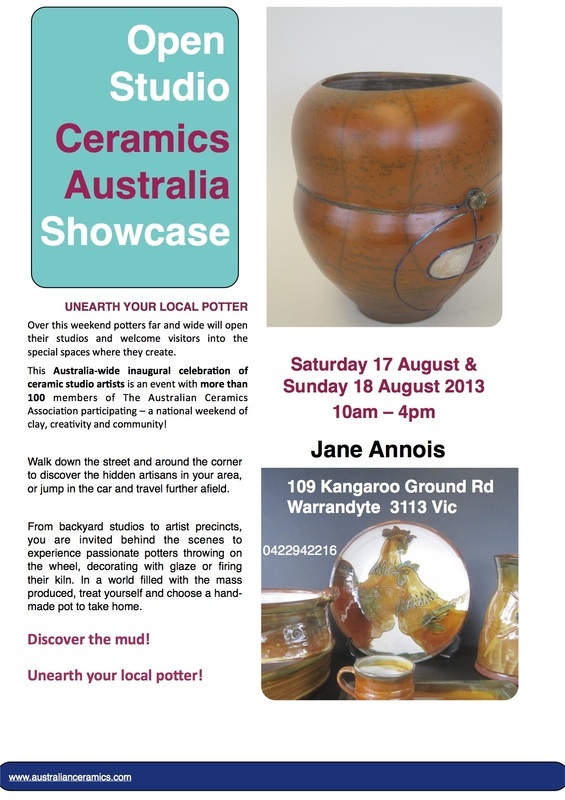 The Pottery Expo is building up to represent over 50 ceramic artists from around Australia and New Zealand. We should have a reprieve from the hot weather. 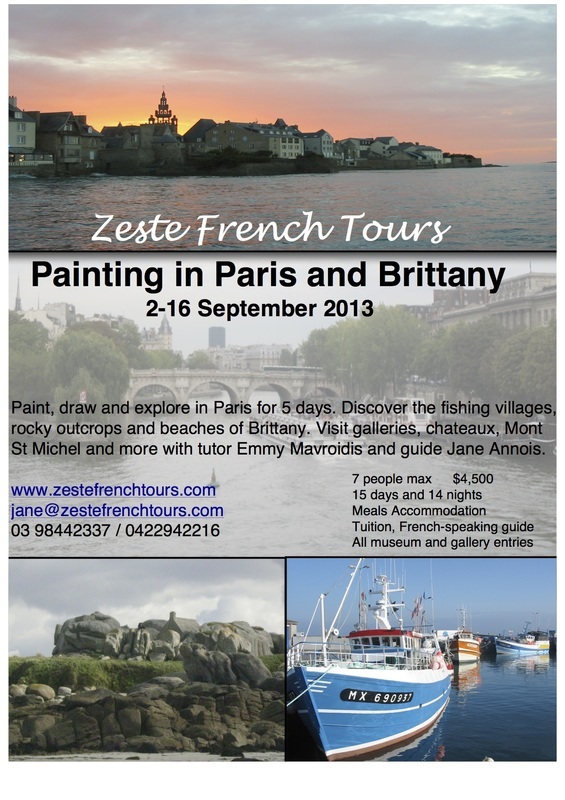 Zeste French Tours will be there too! 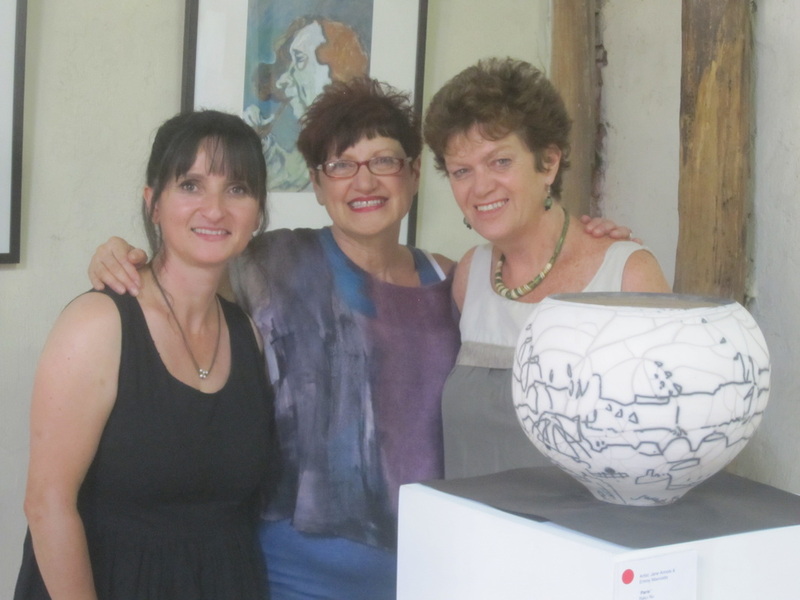 What do a Warrandyte potter and a Warrandyte chef have in common? 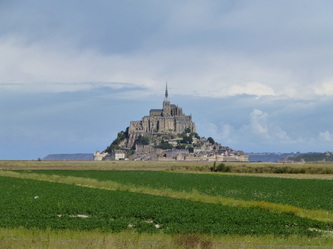 As an unashamed Francophile, a former French teacher and a potter, my two loves have combined over the past 10 years, into taking cultural tours to France. 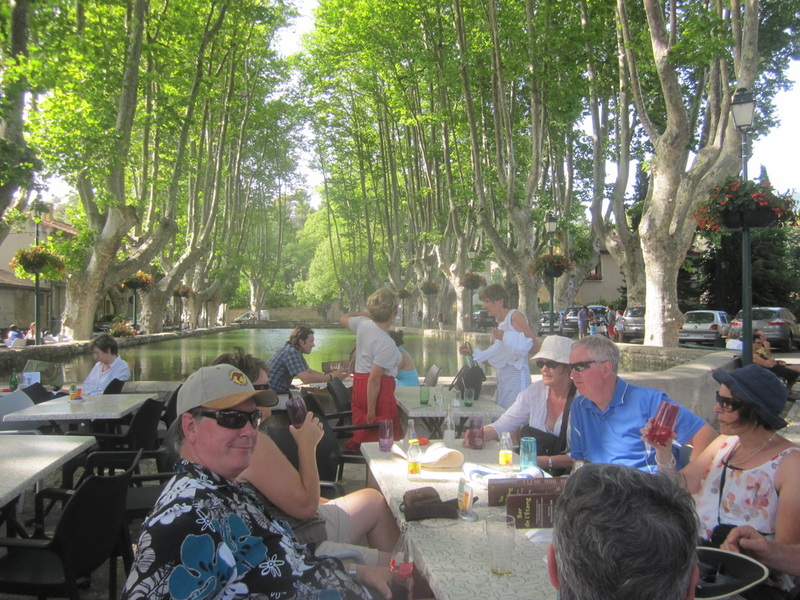 The theme for the tours started with ceramics, of course, and developed to include music tours, art, wine, history, and most regions of France. When Younes Khazour, French chef extraordinaire, now part of the local Boyle clan, talked about his native Loire Valley, his foodie contacts, and experience, we hatched a plan. In September last year we took a group of 8 people to visit the Loire Valley for two weeks. 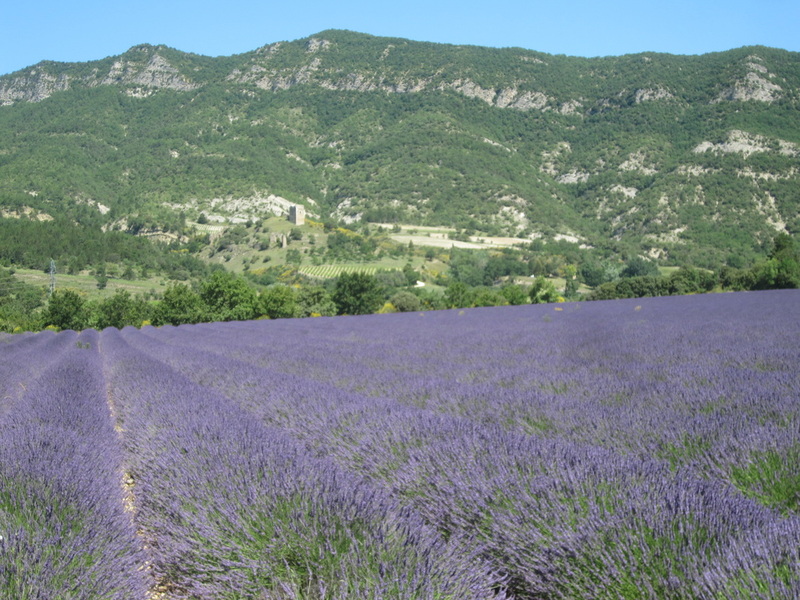 We are both passionate about France, its food and lifestyle and have a similar appreciation for the tucked away gems of the French countryside. 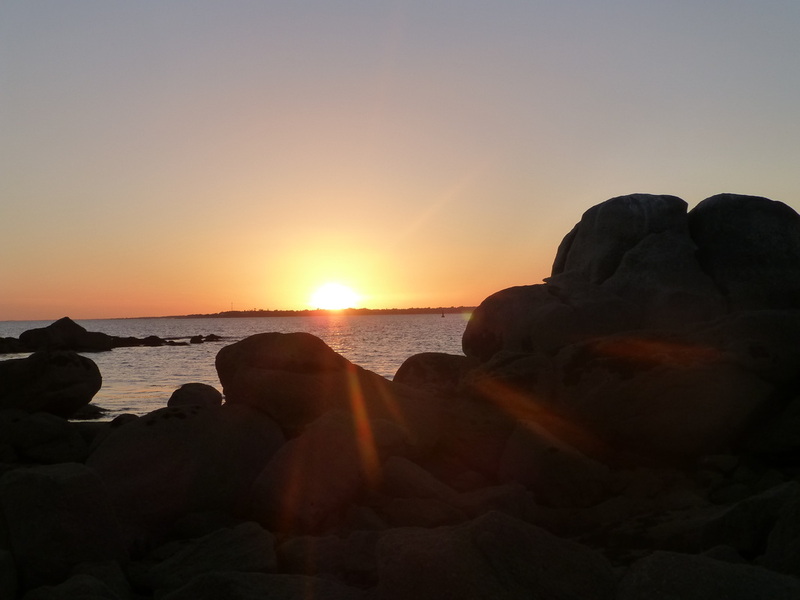 The idea was to find local fromageries, organic food producers, village markets, family run vineyards and the odd not to be missed restaurant, to taste, gather, cook and eat our way around the Loire, while also visiting its famous chateaux and gardens. We stayed at chambre d’hotes, each one for 4 nights. They were more than a bed and breakfast. We were in a17th century manor house, a rambling house tucked inside the limestone cliffs of the Loire and an elegant and extensive farmhouse where we were spoilt by our hostess Elisabeth, a gourmet cook in her own right. She had also invited her sommelier friend to introduce us to some of his favourite boutique wines. Elisabeth and Younes developed a culinary rapport whipping up some magic in the kitchen. We offered our assistance, did a little chopping and mixing under instruction, but mainly did a little of our own winetasting on the side. The chambre d’hote is between Sancerre – wine tasting heaven -and la Borne, the mecca for all potters. Now Younes knew nothing about ceramics and was dealt a hefty initiation. I think I have him hooked. Even the novice is fascinated here. 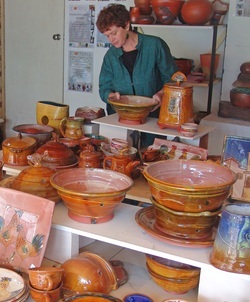 There are about 50 potters living in La Borne, with studio galleries and an International Ceramic Centre, which hosts exhibitions and events. This was my first stop when I first ventured to discover French potteries over 16 years ago. Younes comes from nearby Vierzon not far from Bourges, home to the famous Maison de Forestines, [very special sweets], the Cathedral and the Marais, 135 hectares of lovingly tended vegetable gardens, one of them By Younes’ aunt and uncle, who showed us around. Bourges lights up in the evenings, literally. The sound and light trail took us through the historic centre, a highlight as we followed the music through abbeys, secret courtyards to the chateau. Our adventures would find us in the ancient troglodyte caves where mushrooms have been grown over the centuries for the table. These caves were dug from the limestone cliffs of the Loire river for the stone to build the many and extensive chateaux in the region leaving kilometres of tunnels. The even, cool temperature is ideal for mushroom production, storing wine from the surrounding vineyards and for dwellings. 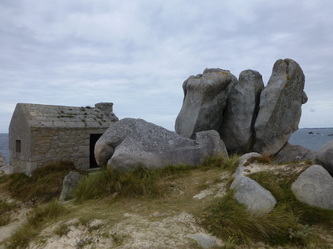 In some, sculptors have carved the rock creating underground galleries. We met a saffron farmer, winemakers, vegetable growers, cheese makers, gardeners and potters. The historians amongst us delighted in experiencing first hand the French history that until the trip had been fascinating reading. We realized the power of Francois I in Amboise, his patronage of Leonardo di Vinci who lived there for his last years. At Chenonceau, the majestic chateau with arches over the Cher River, Henri II ruled France with his his wife Catherine de Medici and mistress Diane de Poitiers, each woman having their own garden on either side of the chateau. When Henri died, Catherine sent Diane off to Chaumont sur Loire, now famous for its annual international garden festival. September is the moment of the “Brame des Cerfs” when the deer calls to its mate in the forest. 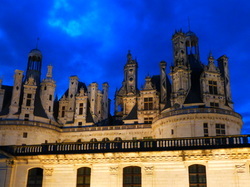 One evening we were staying near Chambord, on a whim we decided to visit the chateau at dusk before dinner. There was no one there. We could walk around the exterior of the chateau at sunset, its towers looming into the night sky. Apparently Francois I had the highest and most ornate towers built here of all the chateaux in France so that only he was the closest to God. There is also speculation that Leonardo di Vinci had a hand in the design as with the extraordinary double helix staircase inside. As the sun slowly descended, the lights on the chateau came up. We felt so privileged to witness the chateau in all its magnificence against the deep blue of the night’s sky.. and serenaded by the deer in the surrounding forest. The next day we returned to Chambord to go inside, with its bustle of tour buses and tour guides with flags. We were so smug that we had had the chateau all to ourselves. I’m sure we saw it differently to anyone else. In between visits to chateaux, gardens, markets and vineyards, we ate, we tried new combinations, new delicacies. We often screwed up our noses too, and politely said well maybe not. We were mildly surprised when Younes on the last day said not to bother coming shopping with him. He will choose tonight. Amazing smells came from the kitchen and a banquet was prepared. Without fuss he had cooked all our fears. If someone had said ‘Oh I don’t eat that’....he cooked it. We enjoyed raw scallops finely sliced in lime juice, steak tartare marinated in cognac and herbs and spices to be eaten in a small “taco” of baked parmesan cheese; snails and garlic butter, there was also melon and fine jambon cru, all finished with his Tarte tatin to die for – with extra caramel sauce. Younes doesn’t know it, but my new specialty at home is tarte tatin, and I am quite tickled that he is taking pottery classes with me. 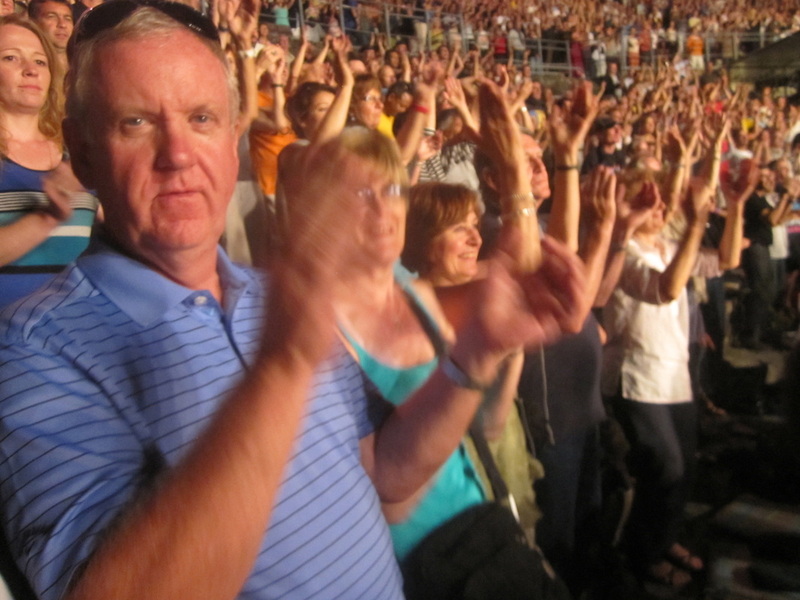 Below is a brief overview of the tours for 2013 - in pictures. 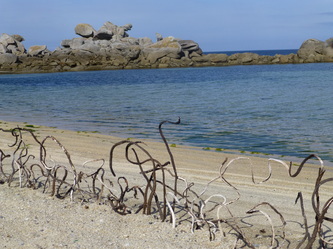 It will give you a good idea of the style of the tours, the places we go to and activities. Enjoy and have a wonderful New Year. 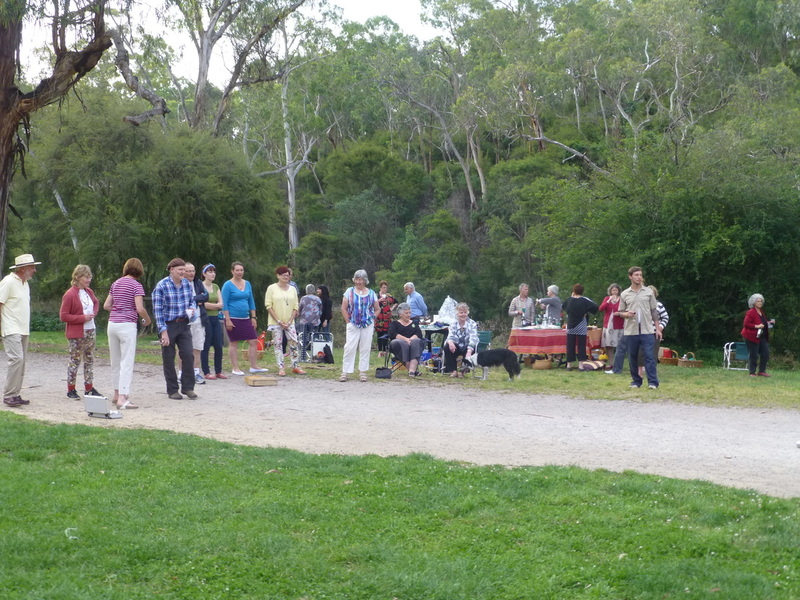 Plonk and Petanque on the Yarra at Warrandyte with Zeste travellers. Time to put it in your diary. 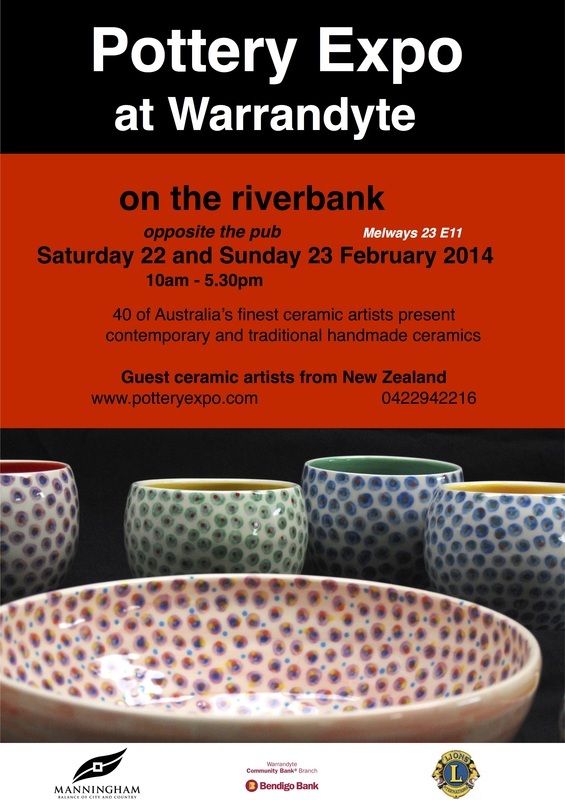 The Pottery Expo at Warrandyte, with ceramic artists coming from all over Australia and New Zealand. 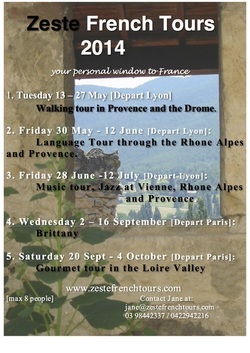 Also MORE information about Zeste French Tours. 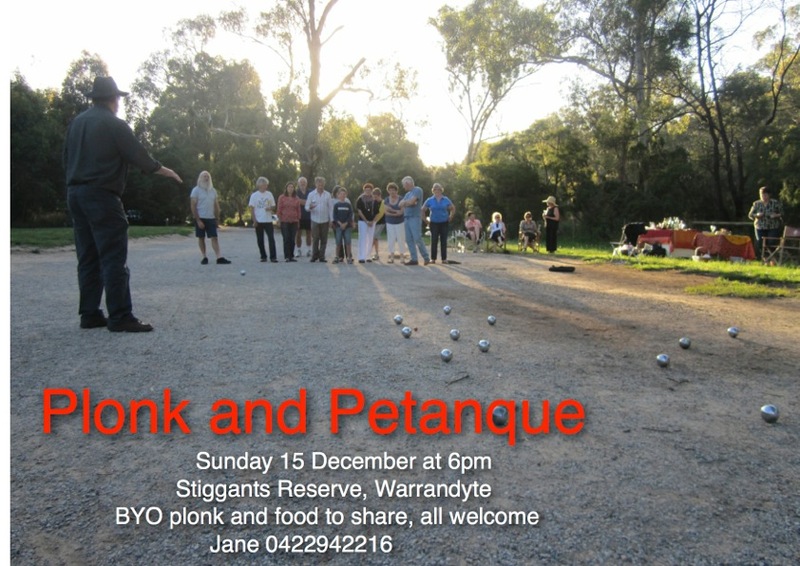 Join us for a game of petanque and a chance to catch up with fellow travellers on 15 December at Warrandyte. 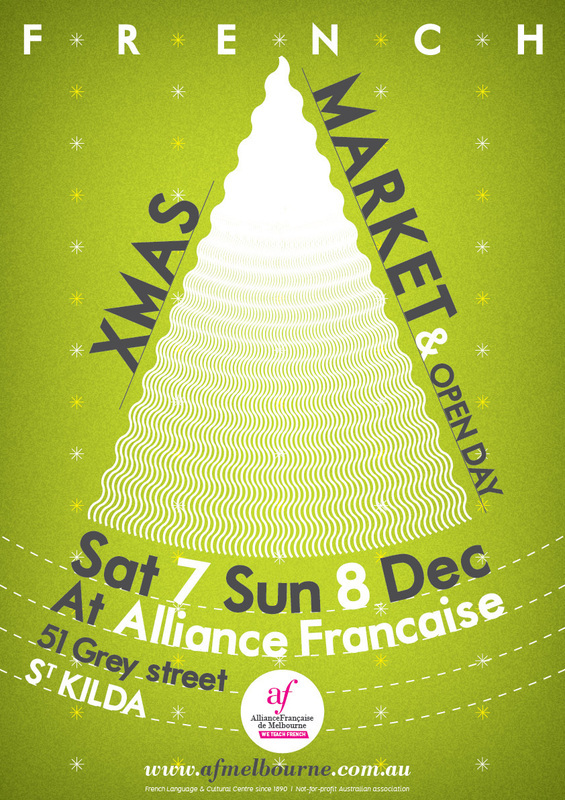 This coming weekend is the annual Xmas fair at Alliance Francaise. I will be there with information about the tours for next year. So gorgeous! My heart is still there. 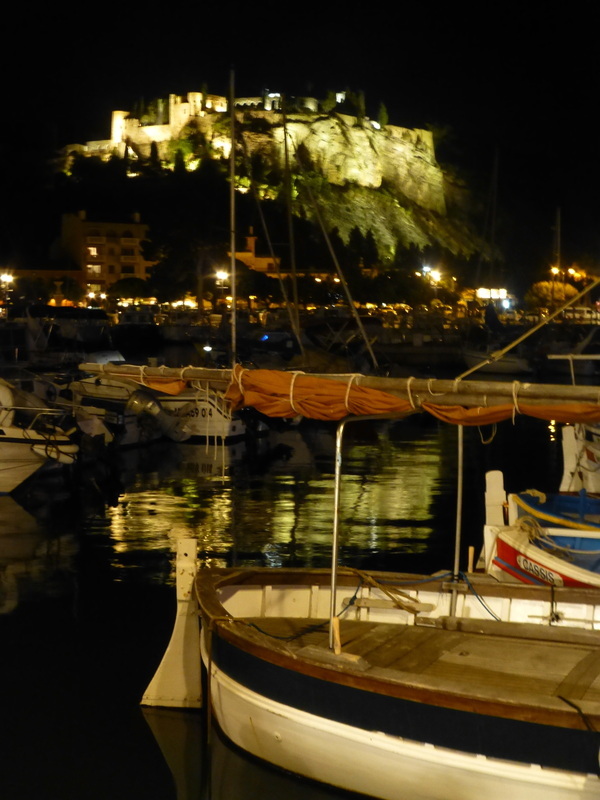 Cassis on a balmy summer's evening. After a cool start in May, summer turned up the heat for swimming and outdoor treats until late into the night. 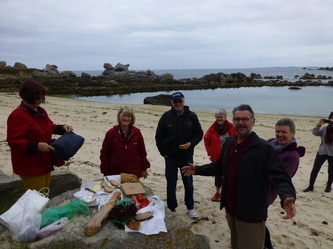 Back home now and preparing for Art in Paris and Brittany and gourmet delights around the Loire Valley. 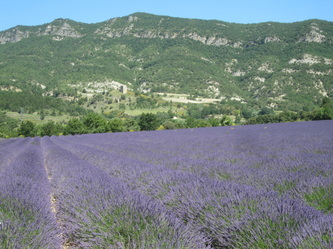 The lavender was in full bloom in the Drome. 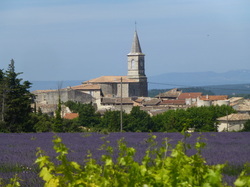 A purple haze, fields of lavender near Taulignan. 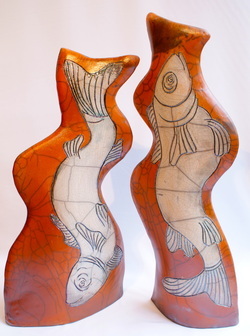 Raku pieces sent over to France for the Dieulefit potters market on the weekend , 18-20 May. Let's hope the sun decides to shine. The start of the 2013 adventures. After Dieulefit, the tours begin. One spot still left in the gourmet tour to the Loire Valley in September - food, wine, chateaux, gardens, artists, sunshine, French villages - what is there not to love? These tours and dates have been chosen in response to your interests and requests. It is early days, but tours to start thinking about for next year. 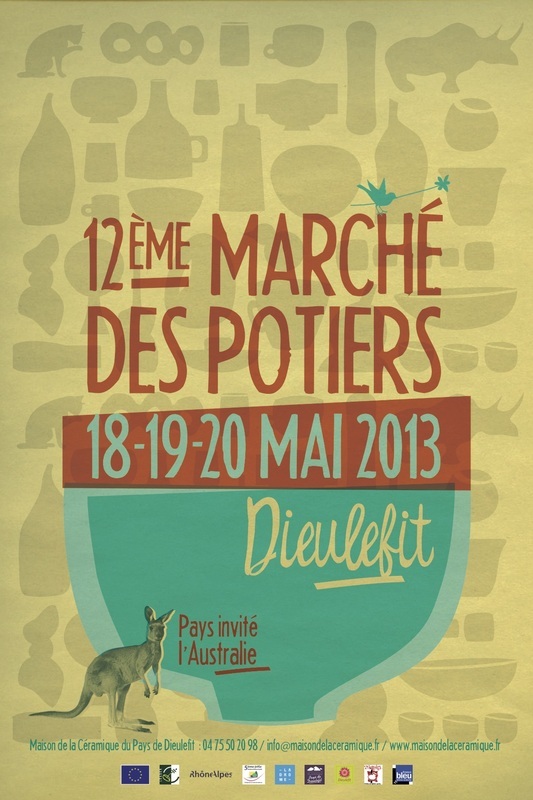 Very busy in the studio preparing work for the Potters Market at Dieulefit. As their guests, we are giving demonstrations and exhibiting our work at this biannual event. It is the year of the Ozzies! Heading off for France on 14 May. Enter the Autumn Equinox. With a new season comes delicious new produce. Come and celebrate this new phase of life with French Chef Younes Khazour as he takes over the industrial kitchen at The Merri, CERES. Working closely with organic and biodynamic vegetables, Younes will showcase his love affair with food and passion for hospitality. 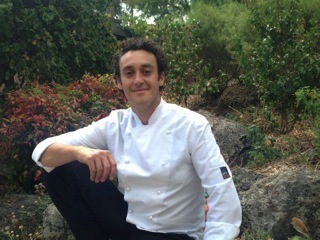 Naturally, his respect for the French contemporary philosophy towards cuisine will be deeply evident! Heritage vegetables will be worked in different declinations using the flavours of yesterday with modern-day cooking techniques. Supported in the kitchen by ex-colleagues and friends Nick Boyle, Sous Chef from Rockpool and Ashley Harvey, former Sous Chef of Bella Vedere (Yarra Valley) this night is destined to be a rewarding culinary experience. 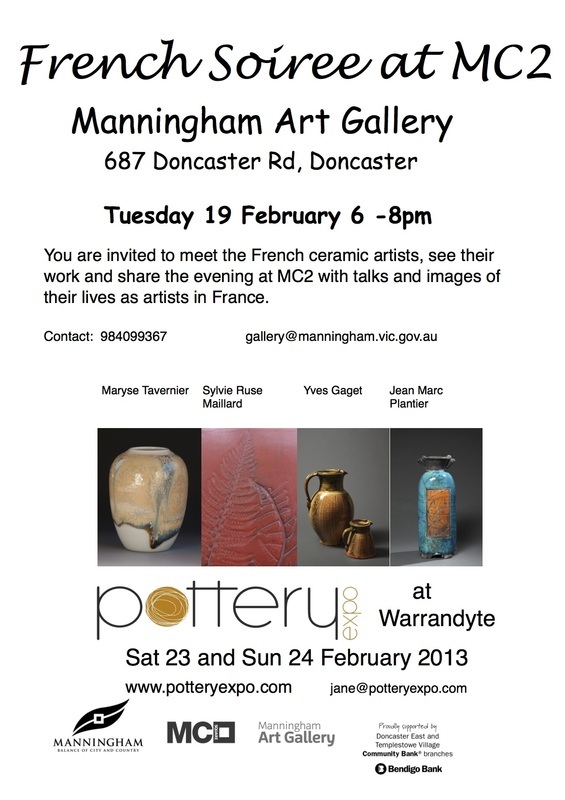 Come to meet the French potters, see images of where they live, studios and surrounds. 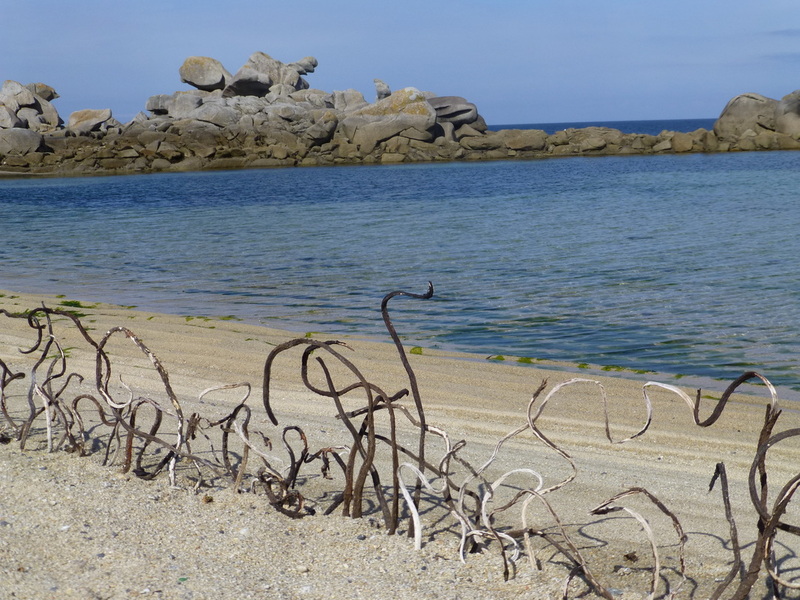 enjoy a glass of wine and hear them talk about life as an artist in France. At Manningham Art Gallery 19 Feb. The French are coming back! For those of you who have been on a tour or two with me, you will have met these wonderful people. It will be quite a reunion. I know many will be travelling from as far as Queensland, NSW and even Perth to catch up with the French who are coming out, and fellow travellers. Those coming are Yves and Maryse Gaget, Maryse Tavernier and Claude Wolf, Sylvie Ruse Maillard and Pierre and Jean Marc Plantier. 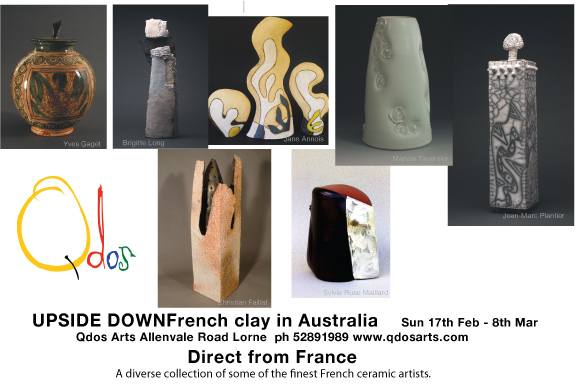 We will be having a ceramic exhibition at QDOS Arts at Lorne, opening on Sunday 17 February at 2pm continuing until 2 March. 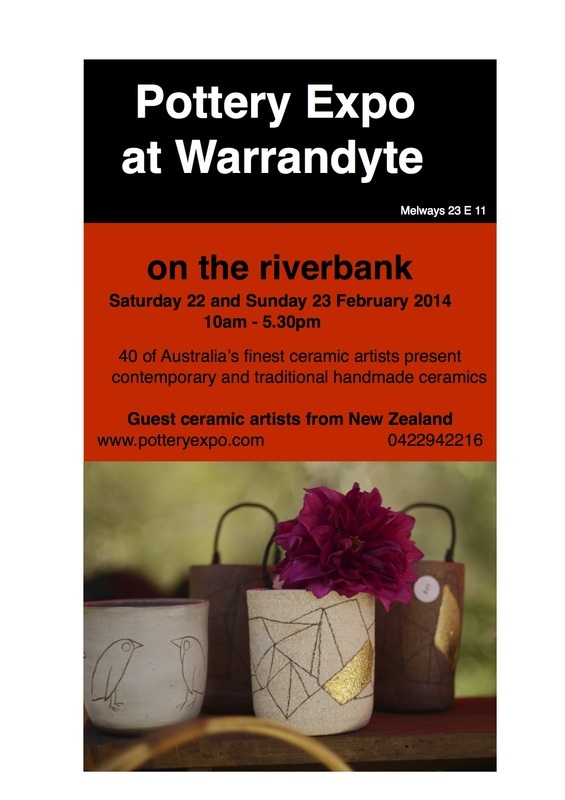 The Pottery Expo Sat 23 and Sun 24 Feb 10am -5.30pm on the banks of the Yarra River at Warrandyte. The Music Tour June/July 2012. Just back: a few glimpses of all the wonderful places and music. 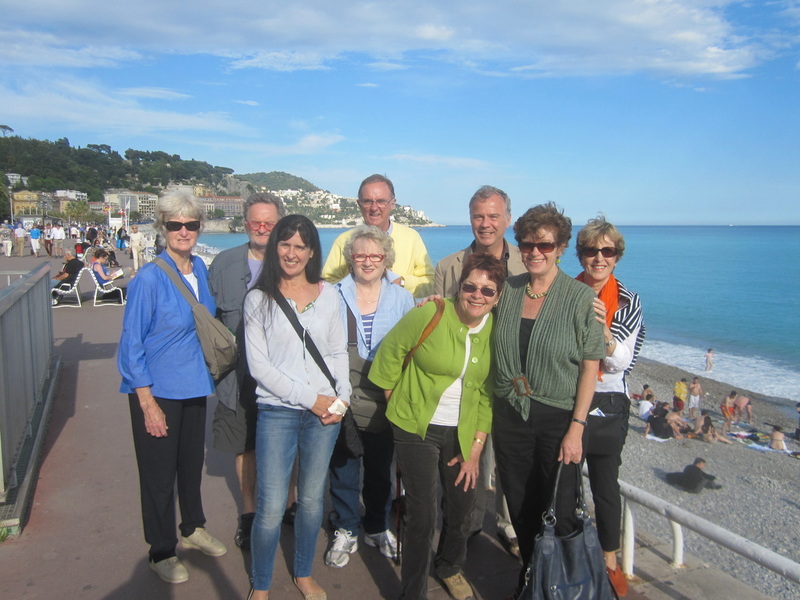 Hi from the Art group to the South of France. This photo was taken in Nice earlier in May. More photos to follow. Ann, John, Pie, Marg, Ron, Chris, Leslie, Jane and Clare. Just back from two wonderful months in France, then straight up to Brisbane for Bastille Day and the Brisbane French Festival. Hello to all the wonderful people we met in Brisbane. Can't wait to spend a few days in Paris before heading south to Nice, enjoying the beach and the mountains, visiting the galleries, going for long walks and painting outside the villages. oh and the food! 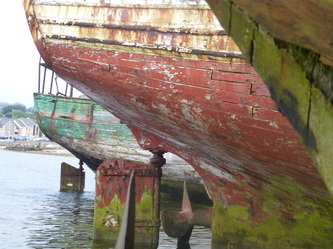 We are heading off for the first of this year's tours on 15 May. Back just in time for Bastille Day - a little ironic but there you go. 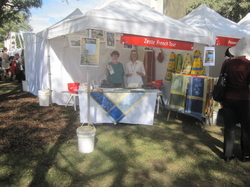 However I am back especially for the French Festival in Brisbane on South Bank. So I would love to meet and talk about the tours for those who are further north. This weekend 5&6 May I have Open Studios [www.artistsopenstudios.com] and will be welcoming those interested in ceramics and French tours. 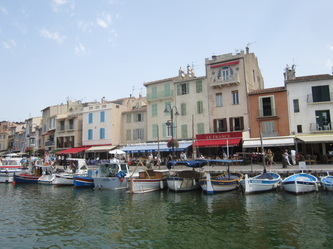 I can be contacted at jane@zestefrenchtours while I am away or by text message at 0422942216. 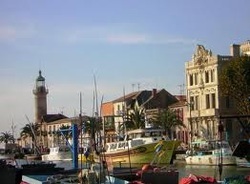 The new itinerary for our tour In May 2013 to the Camargue and South West France has just been announced. 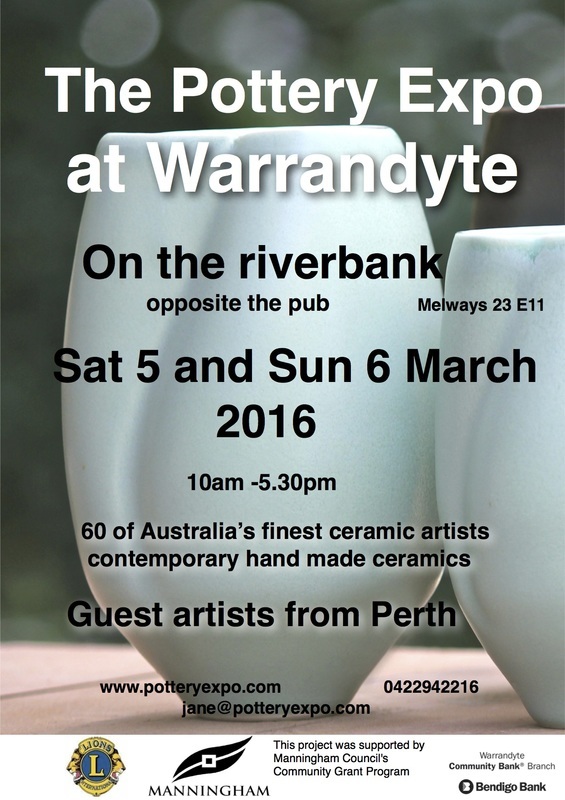 40 ceramic artists from around Australia will be exhibiting their work on the riverbank at Warrandyte. 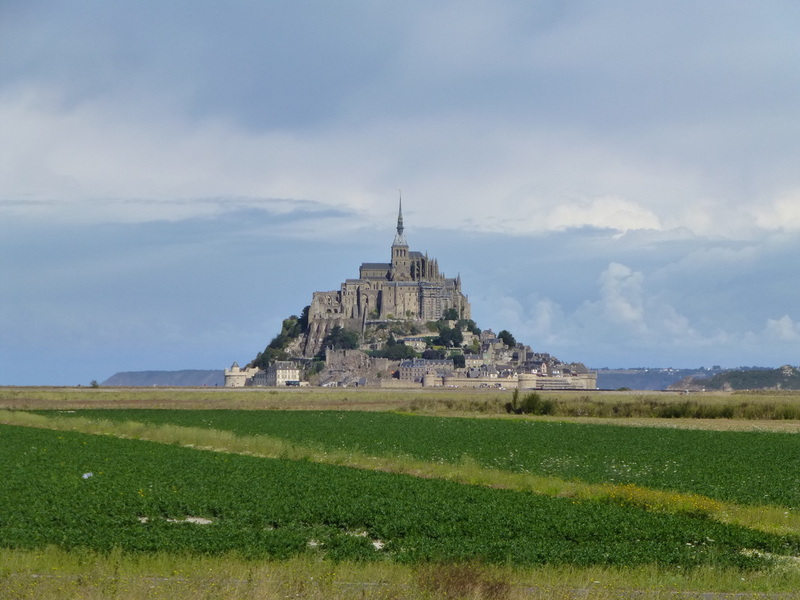 Information about Zeste French Tours. Come to visit and have a talk about the trips. A new tour for 2013: An art tour to Brittany with Emmy Mavroidis. Come to our opening on 25 January of the exhibition of the Loire Valley, meet Emmy and talk to us about the tours. 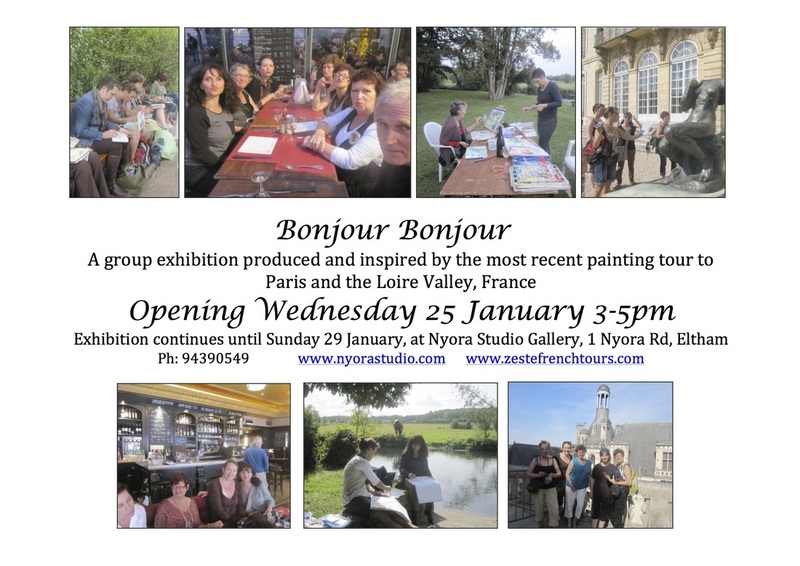 Come to our exhibition opening at Emmy Mavroidis' Nyora Gallery on Wed 25 January. 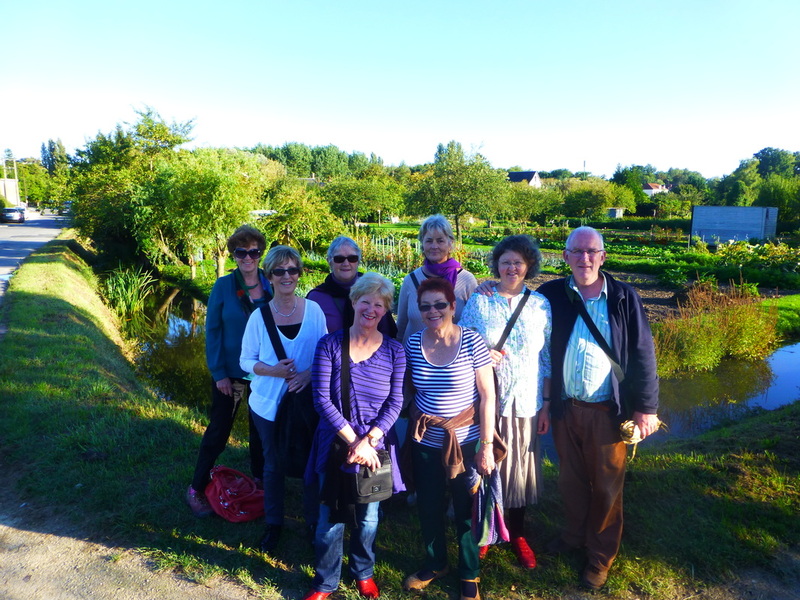 Meet the artists and share the fun of our last trip to Paris and the Loire Valley. 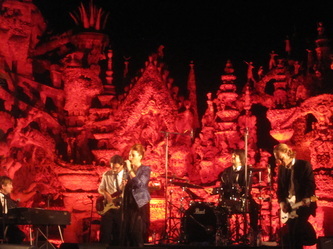 Emmy, Moli and Jane at the opening of "Bonjour Bonjour". Jane and Emmy's collaboration pot with Paris skyline. Moli's painting of 'Woman with Pipe'. 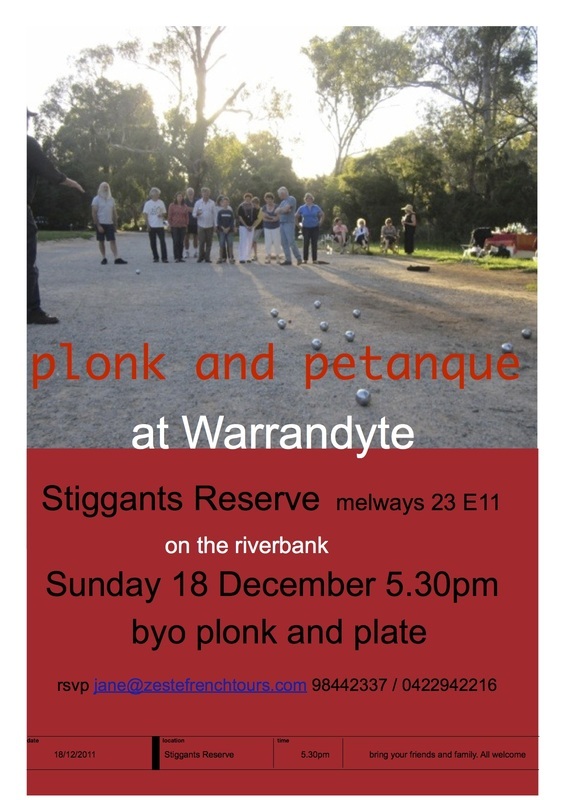 Plonk and Petanque on the river bank. All welcome.